In the last few months I’ve been reading the first two books of Modernist Cuisine on the train to and from work. To my opinion, it’s the very best book on cooking science currently available. At first the 20kg heavy cyclopedia might seem pretty expensive, but if you consider that it actually contains all the knowledge from your complete bookshelf, it’s quite a bargain. What I also like in the book is that it goes very much into detail on the science behind food and cooking techniques, but everything is explained in n easily readable and comprehensible way. The chapter on cooking techniques and utensils in the second book was so inspiring to me, that I tidied up my kitchen and preserved some space for new kitchen equipment. One of the kitchen tools I acquired recently was a microwave. Yes, a microwave, the one and only kitchen tool that has been neglected in the past decades by several professional cooks. Only recently cooks started to use microwaves due to some of its unique applications. From a culinary perspective, a microwave has a lot more to offer. I read about these possibilities in the second book of Modernist Cuisine and I’ll feature each one of them in a post on my blog in the future. First I start with the simplest basic recipe, which is based on a recipe by the famous and well renowned chef Thomas Keller. 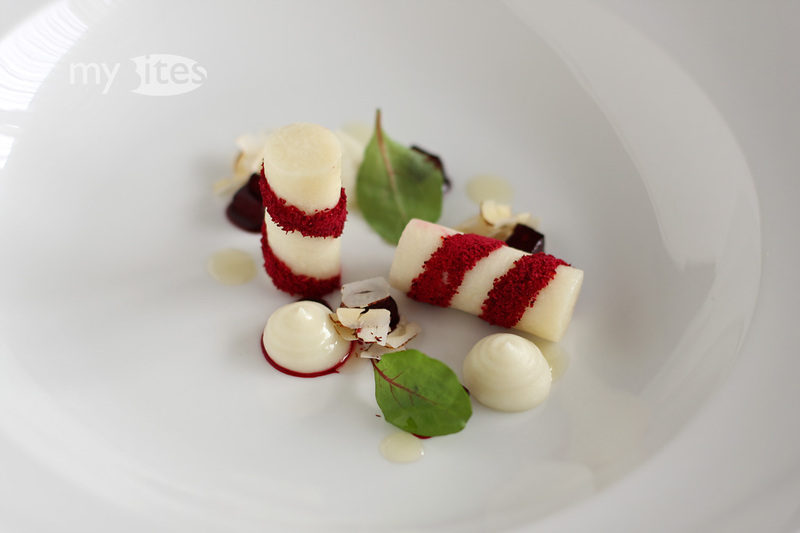 This entry was posted in Appetizer, Vegetarian and tagged appetizer, beets, eddo, goat cheese, goat curd, hazelnut, jerusalem artichoke, pomegranate vinegar, potato, red beet, starter, vegetarian on November 13, 2012 by Robert. Nana, a vegetarian friend of mine, announced a vegetarian month, which aims to motivate people to prepare and eat a meatless meal at least once during this month. Besides eating less meat, hopefully the participants will also think a little bit about the vegetarian diet and probably notice that meat does not need to be present on the plate every day. All submitted recipes participate in a contest, where the winner gets an invitation to nana for a vegetarian dinner. Originating from nana’s call for recipes, I took the opportunity to give a thought not only about the vegetarian, but also about the vegan diet. This entry was posted in Appetizer, Vegan, Vegetarian and tagged appetizer, cabbage, chestnut, chestnut puree, jerusalem artichoke, savoy cabbage, sunchoke, tapioca, vegan, vegetarian on December 14, 2011 by Robert.